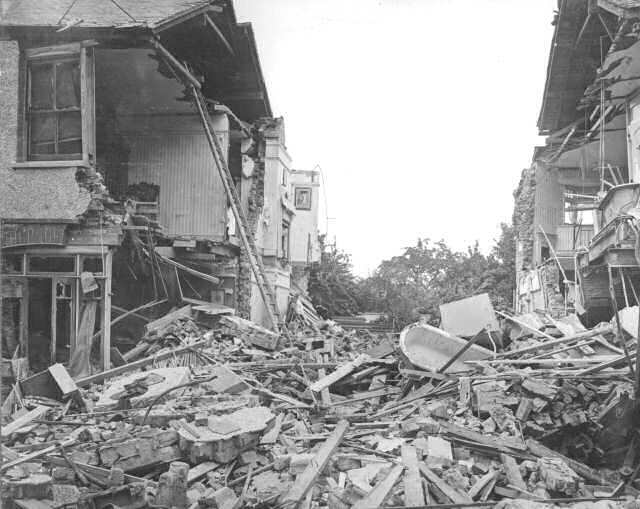 Air-raid damage to houses in Baytree Road caused by a Zeppelin L31 airship. The nine airships that reached England on 23 and 24 September 1916 dropped a total of 371 bombs causing many casualties and extensive damage to properties in South London. The Zeppelins were cumbersome and slow moving, carried a very light payload of bombs and were relatively easy targets for Allied defences. 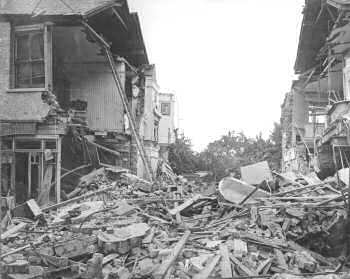 The damage was very minor when compared with the highly organised bombing raids of the Second World War. Although the house in the centre has been completely demolished, the walls and floors of the adjoining properties are still partly intact and the terrace was successfully rebuilt after the war.